A white marble monument comprising the statue of a soldier standing at rest with a tree trunk supporter behind the right leg, this is surmounted on a capped two-tier pedestal that in turn is mounted on a two-tier granite surbase and concrete base. The base has angled faces that are covered in polished black granite plaques. The memorial was Heritage Listed through the Consolidated Mitcham Development Plan September 2005, page 233-234, Item BKW:007. 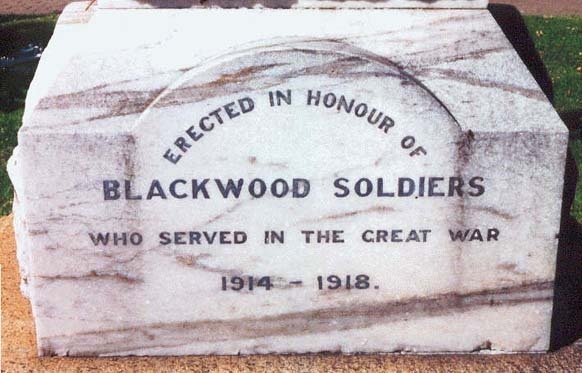 ERECTED IN HONOUR OFBLACKWOOD SOLDIERSWHO SERVED IN THE GREAT WAR1914-1918. MAINTAINED BY: City of Mitcham. PECULIARITIES/DAMAGE: Repairs completed in 2014 to rifle and pedestal. DESCRIPTION: A white marble monument comprising the statue of a soldier standing at rest with a tree trunk supporter behind the right leg, this is surmounted on a capped two-tier pedestal that in turn is mounted on a two-tier granite surbase and concrete base. 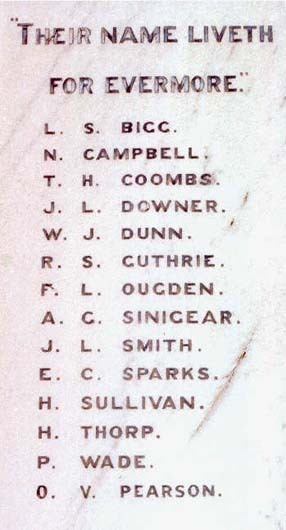 The base has angled faces that are covered in polished black granite plaques. MAINTAINED BY: Blackwood Council. 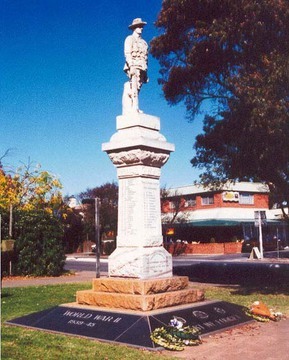 The memorial was Heritage Listed through the Consolidated Mitcham Development Plan September 2005, page 233-234, Item BKW:007. Reference; Darren Kruse update 05 March 2007. PECULIARITIES/DAMAGE: Muzzle of rifle broken, crack in rear of pedestal. Showing 4 of 11 images.